Act Now for special financing options that we are offering on the NEW Zeiss Supreme Prime Lenses and the RED MONSTRO and HELIUM Cameras. The Supreme Prime Lenses were designed with Full Frame Cameras in mind, and the RED MONSTRO is the first camera on the market to support the common iTehchnology AND Zeiss eXtended Data ON CAMERA! This future proof set up will put you at the forefront of camera AND lens technology. ZEISS Supreme Primes - Preorder at Innocinema! The ZEISS Supreme Prime lenses combine cinematic large-format coverage and high speed aperture in a small, lightweight lens. Their look is characterized by a gentle sharpness and a very smooth transition between the in-focus and out-of-focus areas. The Supreme Primes give the creator absolute control over the image by revealing subtle nuanced details in deep shadows and bright highlights. The Supreme Prime lenses are not replacements for the ARRI/ZEISS Master Prime or Ultra Prime lenses. Instead, they are full-frame lenses from ZEISS developed for the digital high-end cinematography market. Zeiss strives to have the most neutral color reproduction in the market. Therefore, the Supreme Prime lenses will be easy to combine with footage from the CZ.2 zoom lenses, MP or UP prime lenses. The Supreme Prime lenses are ideal for the ARRI Alexa LF, RED Monstro VV, Sony Venice, or the Canon C700 FF. RED Digital Cinema is advancing its product portfolio of high-quality cameras and sensors with a focus on simplicity, price and quality for customers. Beginning today, RED’s camera line-up will be modified to include one DSMC2 camera BRAIN with three sensor options - MONSTRO 8K VV, HELIUM 8K S35, and GEMINI 5K S35. 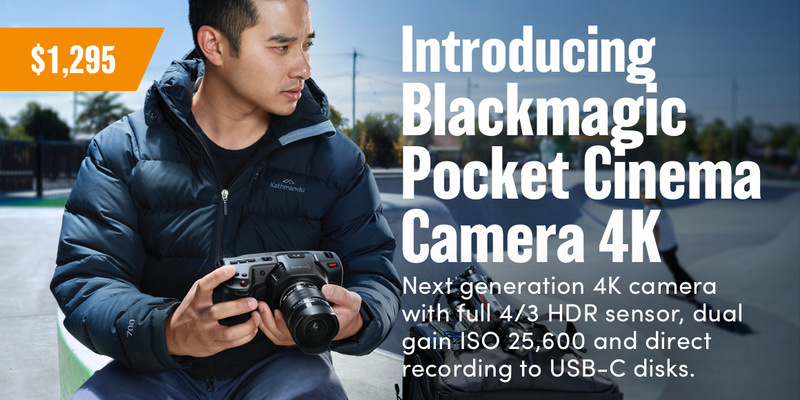 The single DSMC2 camera BRAIN includes high-end frame rates and data rates regardless of the sensor you choose and in addition to this new value, the streamlined approach will result in a price reduction compared to RED’s previous camera line-up. It’s time for NAB again and we have been working harder than ever on some exciting new products that we would love to update you on. This year we announced DaVinci Resolve 15, a massive update which now has Fusion built in, the new Blackmagic Pocket Cinema Camera 4K, ATEM Television Studio Pro 4K, Cintel Film Scanner 2, a new HD multiview, new video converters, HyperDeck software updates and much more! Here are a few details on each new product! chance to WIN your own Misfit Atom or Titan Arm. Innocinema is now accepting several different cameras from ARRI, SONY, Panasonic, Canon, and Blackmagic Design for a trade-in value of anywhere from $2,500 to $23,850 off of a RED SCARLET-W, EPIC-W, WEAPON 8K S35, or WEAPON 8K VV with MONSTRO. ARRI combines ALEXA image quality with the largest full frame sensor of any cinema camera on the market for the true 4K ALEXA LF, along with new Signature Prime lenses and the LPL lens mount. Come join the Innocinema team and ARRI representatives on October 21st for an introductory training and demo day with free food and drinks! ARRI industry standard camera products such as the *NEW* ARRI Alexa SXT W, ARRI Alexa Mini, ARRI WCU-4 and Cforce Wireless Follow Focus, ARRI Master Grips, ARRI MAXIMA and TRINITY will be at the workshop for hands-on training. A variety of ARRI’s professional camera accessories (PCA) will also be on display. Innocinema - Black Friday, Small Business Saturday, & Cyber Monday SALE! !